I love meatball soup and make several variations on the theme. This one is an easy soup recipe (well I don’t make them unless they are easy soup recipes, so that’s a given). Tasty meatballs are made from a mixture of pork and beef and added to a nicely balanced vegetable soup. Of course you can use all beef if you prefer. The pork and beef mixture does have a nice taste though. Combine the ground pork and beef in a large bowl and add the parsley, Worcestershire sauce, salt and pepper. Blend together well. Form the mixture into to 3/4 inch balls. Heat oil in a large soup pot over medium heat. Working in batches, add the meatballs to the pot and brown them on all sides, about 4 minutes. Transfer each batch to a bowl. Pour off all but 3 tablespoons of the drippings from the pot. Add the potatoes, carrots, leeks and rutabaga and saute the vegetables for about 5 minutes to soften them. Add the broth and tomatoes with their juices. Return the meatballs to the pot. Bring the mixture to a boil over high heat. Reduce the heat to medium and simmer, uncovered, until the meatballs and vegetables are tender, about 45 minutes. Season with salt and pepper to your taste. If you like Worcestershire sauce, add a bit more near the end. Add it before you add the salt though as you don’t want the soup to be overly salty. The nice thing about making homemade soup is that you can vary the recipe to suit your taste. If you have read many of the recipes on this site, you know I am a big fan of switching things out to suit you when it’s possible. That’s what makes cooking so much fun and so creative. Do remember though that the more you switch things around or add new ingredients the more you are going to change that original taste that was developed in the recipe. I can’t even count the times that I overly-tweeked a recipe: Adding ingredients that I thought would make the recipe more healthy, only to find that I had altered the taste so much I didn’t like it. So, at least the first time you make the recipe, give it a change at least close to what the original recipe says. Then, for the next time, switch it up the way you want and see how you like it. If you are looking for a healthy soup, just check out the nutritional stats on this vegetable and meatball soup recipe. Not only is it a full meal in a bowl, it is rich in protein, Vitamin A, Vitamin C and iron. I love one pot meals that are good for us. 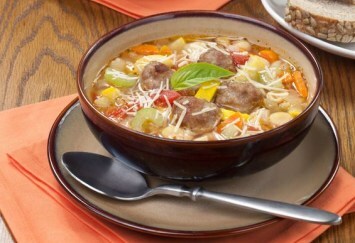 You will find more easy soup recipes like this meatball soup, here. Our meatball recipes are here. If you like this recipe, please take a moment to Pin it to Pinterest, Tweet about it, Like it on Facebook and leave a comment below. Thanks a lot. It is much appreciated. 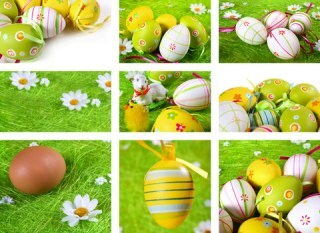 I would also love to add your recipes to the site, to share with the Cookingnook.com community. Click here to add your own favorite recipes to the blog..